Paying bribes has become a way of life for many ordinary Syrians - and with the economy expanding fast, there are fears that the scope for corruption is growing too. It should be a simple process: obtaining the necessary paperwork to renovate your house. Yet at the government property registry office, where piles of aged yellow papers are stacked in corners, one man told me he had spent six months on the task. "I come here twice a week," he said. Why the delay? "I don't pay bribes. Maybe that's why it hasn't been completed. Because other people want money." Outside the office, unofficial paper processors sit at wooden tables on the street. 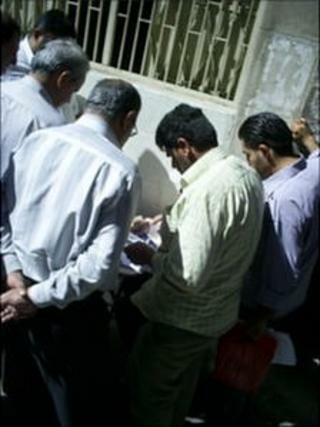 People gather around giving them cash which they use to pay off the civil servants inside, so that the paperwork is processed more quickly. One of the unofficial processors said he always paid bribes to get things done. "Every single employee I pass I give a tip," he said. "It's a simple process. I pay $4 to $5 (£2.50 to £3.25) to each one." Most public sector workers make on average $250 a month (£160), so some turn to bribes to boost their salary. "I do two jobs to make ends meet," said one civil servant, who did not want to be identified. "The public salary doesn't cover my basic family needs. That's why many people take bribes or do another job." Giving backhanders is a daily experience for ordinary Syrians. Now, with a booming economy, there are reports that large-scale corruption is booming too. The government says the country's GDP has leapt from $18bn (£12bn) in 2000 to almost $60bn (£39bn) today. International investors are entering markets such as telecommunications and energy. According to Jihad Yazagi, the editor-in-chief of the Syria Report economic news website, "there's a sense in the business community that you can't do business in Syria unless there is a certain level of corruption." "Investors know how it works. They know if they come here they have to pay some money outside the formal channels, in terms of bribes." The most recent official government figures reported $104m (£67m) was lost as a result of corruption over the most recent 19-month period. Analysts believe the true figure is substantially higher - although getting the information is difficult. "Corruption goes all the way up in Syria," said Yaki Akeem from the Lebanese Transparency Association. His organisation is unable to operate freely in Syria. "You can see it in procurement, when you have big contracts with big companies and you're talking billions of dollars - operations involving oil and energy. This is unfortunately international level." Economist Arif Dalila points to companies that use corruption to obtain monopolies which they exploit to make enormous profits. For example, he argues that this is the main reason why cars in Syria cost some 80% more than in neighbouring countries. "Now in Syria nobody can hope to reform the situation and fight very seriously, because some people have big interests and nobody can fight against them." Mr Dalila was, himself, detained for seven years after highlighting the issue of corruption. However, the Syrian government says it is cracking down on bribery. "The size of the economy has dramatically changed," said Abudullah Dardari, the deputy prime minister for economic affairs. "The sense of corruption may be much more - but I don't think corruption is worse today. I am not saying there are no corrupt civil servants in Syria, but we are not where the perception is or where we should be." One example of the government's anti-corruption drive is a new Citizen Service Centre in Damascus. The aim is to stop paperwork from becoming bogged down in endless red tape. Rani Aboud, the manager of the centre, says new procedures prevent employees from taking backhanders. "People come and deal with employees who process their papers through a computer system. "I can monitor everything, every document delivered and how long it takes. So there is no way for anyone to pay bribes." However, economist Arif Dalila believes that the big offenders will continue to get away with it. "The government cracks down on individuals. Very, very small corruption. Not everybody is equal under the law." Lina Sinjab reports on corruption in Syria for Crossing Continents on BBC Radio 4 on Thursday 30 December at 1100 GMT. You can also listen via the iPlayer or download the podcast. Are US sanctions against Syria working?